As any adult knows, getting the kids to eat right can be a real chore. Children generally prefer sweets to vegetables, and if the truth be told, so do the grown ups. 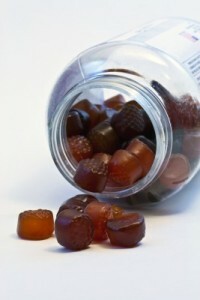 One of the most popular sweet treats over the years has been gummy bears and gummy vitamins. Those sweetly tart, chewy little bear shaped candies are a definite hit with both kids and adults. The gummy bear phenomenon has expanded to include gummy worms, gummy snakes and gummy cartoon characters. Now, the gummy revolution is focusing on getting kids, and adults, to eat well. One of the fastest growing trends in the health supplement market is the gummy bear vitamin. They’re sweet, they’re fun, and they’re deceptively chock full of vitamins and iron. One of the major draws of gummy bear vitamins is the fun factor. Fun shaped sweets appeal to children, and are a good way to get kids to take their vitamins. That all important fun factor needs to be reflected in the packaging. Whether it’s bears, worms or superheroes on the inside, the package itself needs to establish the fun and vitality of the gummy vitamin product. Many manufacturers of gummy vitamins opt for a colorful approach to their packaging, in both the labels and the basic container. Clear colored plastic allows the product to be seen and recognized by the customer, and helps to lend a distinctive look to the product on the retail shelf. This colorful approach to the packaging of children’s vitamins also engages with the target consumer. Children can be a big motivator when shopping with their parents, and when they spot something on the shelf that they want, mom and dad hear about it. In keeping with the notion of reflecting the fun of gummy bear vitamins through the product packaging, some manufacturers are experimenting with new shapes in their rigid packaging. Flared, or bell shaped plastic bottles help the product stand apart from the more traditional vitamins on display. Again, the fun factor equates to interest from children, and that interest is quickly relayed to the purchasing parent. Using an alternative packaging model is a good way of achieving both product and brand recognition, and manufacturers are always on the look out for ways to solidify their product’s identity in the consumer’s consciousness. Both of these alternatives to the traditional packaging and marketing of vitamins offers a high visibility quotient, as well as the distinct advantage of being easy to implement. An experienced contract packaging partner can help a manufacturer to design a suitably eye catching container, and can suggest colors and labeling possibilities to make the product really stand out. The health and wellness market has become crowded with vitamins for both adults and children, and grabbing a potential consumer’s attention begins with attention grabbing packaging. Once the package design has been approved by the manufacturer, the contract packaging service can go to work. Even with an alternative design for the vitamin’s rigid container, the blend and fill packaging process remains basically the same. Any secondary packaging processes, such as bundling for club sales or hand assembly for point of purchase displays, can be completed during final fulfillment. Again, the fact that no major retooling needs to be done on the contractor’s end means that these packaging changes can be achieved quickly and cost efficiently. Putting these packaging and marketing changes into effect begins with choosing the right Contact packaging partner. Assemblies Unlimited has more than 18 years in the packaging business, and can offer state of the art facilities as well as the experienced workforce needed to take your project from raw product to final fulfillment. AUI is safety certified by the FDA, AIB and GFSI for food handling, so you can be sure your project is in good hands. Assemblies Unlimited offers their business partners the latest in packaging trends, and remains unsurpassed in providing the packaging solutions manufacturers expect. Gummy vitamins are well-loved by kids and for sure by taking some effort to enhance its package, it will be a lot easier to bring the product closer to their target clients.